Seagrass rugs are a popular type of natural fiber rug. They offer softness, flexibility, and an organic look to your personal domain. These thick, reedy mats are nicely textured and expertly framed, providing a long lifespan and durable good looks. These rugs are growing in popularity thanks to their all-natural appeal and neutral tones and home decorators are seeing them pop up everywhere. They're perfect for naturalists, minimalists, or folks needing a handy earth-tone rug that adds feel in addition to look. Seagrass rugs are sometimes called coastal rugs or beach rugs. Inspired by reed mats used in the Pacific Islands, these rugged weaves are crafted of natural seaside reeds, an organic material similar to sisal or jute. 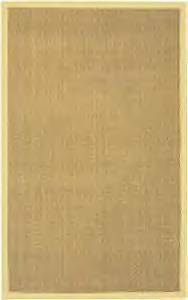 Most seagrass rugs are left unbleached and undyed. Due to natural variations, these rugs can be found in rich caramel browns, tans, creams, and off-browns with a slightly shiny finish (a natural effect of the seagrass). 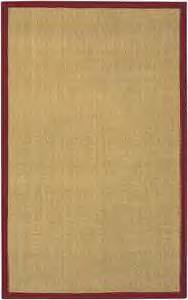 Most seagrass rugs are framed by plush cotton chenille banding at the border, which ensures a sturdy piece. The cotton borders are usually thread-dyed, adding an extra dimension of tone to the rug's usefulness. The most common frame hues are: green, teal, jade, black, chocolate, red, terra cotta, tan, paprika, and butter, though other colors do exist. Some of the more refined seagrass rugs incorporate cotton fibers throughout, often using a complimentary or matching color to the border. The cotton fibers are subtle, yet effective, giving seagrass a new dimension. They also add strength and shading. Bare-bones seagrass rugs don't have a colored cotton border, and instead have minimal stitching (it is still usually cotton) that doesn't detract from the tropical mat look of the overall rug. The stitching is necessary to complete the rug and to secure its natural edges. These rugs are the most organic looking, serving any decor with graceful, woody presence. Seagrass rugs come in a broad range of overall sizes, like most rug types do, but they're usually done as rectangles or squares due to the nature of reed weaving. Layered side-to-side strands of seagrass fiber are woven together, making an attractive 4-sided shape, usually with a ribbed texture. Since the plant material lends itself well to making rectangles, you'll find seagrass available as accent rugs, throw rugs, area rugs, floor rugs, and even take-along beach mats. Anything you could ever need to mark "your spot." Best of all, seagrass rugs resist soil, stains, and damage. They are easy to wipe clean. They are forgiving when it comes to accidents, making them a joy to use in heavy traffic areas. They work well with kids and pets. You can use them anywhere - in hallways, by the entry, or at the back door. They may look tropical and fragile, but they're tough as nails. Consider using seagrass rugs wherever you need superior floor protection or a touch of Mother Nature. Their rugged charisma is appealing in casual, formal, or traditional settings. They can blend into the background, or serve center stage just as easily. Seagrass rugs are comfortable to sit or play on and are very low maintenance. With reasonable prices for tightly woven material, you can't go wrong! Also, you might want to consider getting some large door mats to help protect your floors.